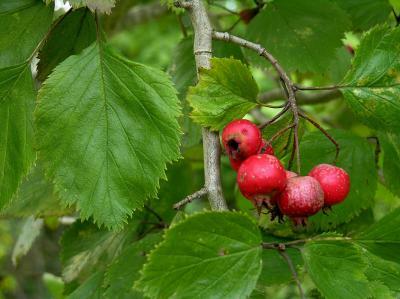 Crataegus mollis fruit and leaves.© 2014 Virginia Botanical Associates.vaplantatlass.org. (Accessed 5/2014). Crataegus mollis small tree to 12 m tall, roots associated with ectomycorrhizal fungi (Dickinson 1985), sparingly thorny, thorns tend to be quite long (ca 2-4 cm), young twigs wooly, becoming smooth, dark brown sprinkled with tiny, pale lenticels; stipules 1.7 cm, asymmetric, curved, toothed along one side, deciduous. Leaves alternate, stalk about 4 cm long, blade to 10 cm long, 8 cm wide, broadly egg-shaped but variable, usually lobed, margin toothed, hairy above, wooly below when young, becoming almost hairless above, slightly hairy below, veins running to tips of leaf teeth. 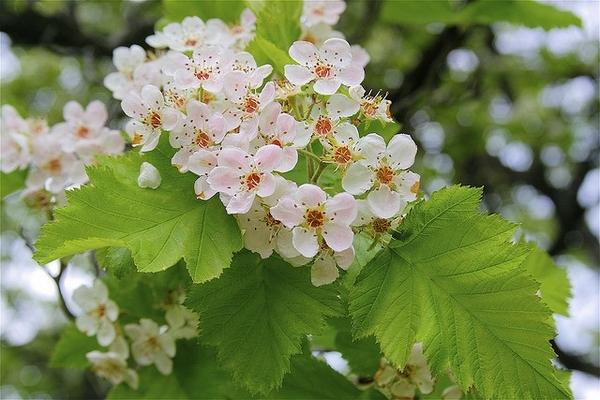 Crataegus mollis flowers by Dan-Mullen. cc-by-nc-nd. plants.ces.ncsu.edu (Accessed 2/2018). Flowers white, 1.6-2.3 cm, in branched clusters, stalks wooly, sepals coarsely toothed with glandular tips, persistent in fruit, wooly on both sides. Fruit fleshy, red with tiny pale dots, large, 1.3-1.7 cm, ends hairy, flesh yellow, edible, seeds 3-5. Habitat: Cultivated. Very infrequently escaped in edges. More usually overgrown horticultural specimens. Appears fairly shade tolerant.